Summer seems like it just got here and now we're having a clearance? I shouldn't complain since it's REI, and they have the cooleset gear alive. Take up to 30% OFF thousands of top items throughout the store. 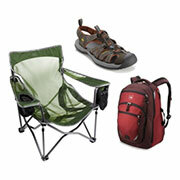 We're not talking cheap brands here - The North Face, Keen, Teva, and (of course) REI are included. Get everything from new hiking apparel to a new Novara Corsa bike. They even have those new Fibram FiveFinger Shoes I keep seeing around the trails. I still want that kayak for $300, but I don't think it will fit on top of my Honda Civic.